This design started with an actual photo of a cecropia moth taken by a friend of mine. 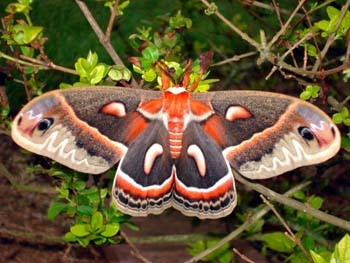 These moths appear only briefly in the spring and as you can see they are breathtakingly beautiful. The photo was scanned and then added as a background into Glass Eye 2000. 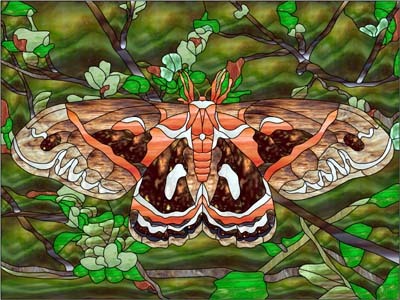 The moth and background elements were carefully hand-traced with the drawing tools. Care was taken when tracing to make sure that the cut lines did not distract from the overall flow of the design. Before I have a pattern completed I begin selecting the glass because it helps me throughout the remaining drawing process. I selected glass from the Glass Eye 2000 glass library that best represented on screen or paper what I wanted for the completed panel. The actual glass used for the panel was hand-selected. 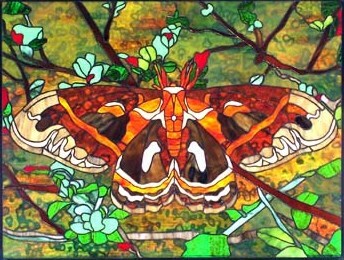 I chose glass with texture that best represented the fuzzy coating (scales) of the moth. Much of the glass was "fussy cut" in order to use a particularly beautiful section of the glass, or a particular color streak within the glass. The panel was constructed using the copper foil method. I used black patina to age the solder lines. I like black patina because it draws the eye to the picture the glass creates instead of drawing the eye to the silver solder lines. After patinating I waited 24 hours, and waxed the panel with carnauba wax. I included copper-colored lines within the design to depict the moth's antennae. I found some brass filigree, cut it to the shape of the antennae, tinned and patinated it to match the solder lines, attaching the filigree into the solder lines at the head of the moth. For those interested in constructing this design, please realize that the glass I chose in Glass Eye 2000 is not always the actual glass used to complete the panel. It is the glass that on my computer or printed with my printer represents the best color or flow towards the most artistic presentation of the completed design. If anyone would like the exact glasses used in the finished panel, please contact me via our website. Many of our finished panels are original designs. We are able to create these effectively and efficiently using Glass Eye 2000. We had previously tried a couple of other drawing programs, but they were either overly complicated or too simplistic in their features. We took advantage of the 30-day free trial, and then decided that this was the software for us. We are able to give our customers a realistic representation of their completed stained glass window. We can change colors, add or remove design elements easily, and complete the design process towards a commission piece while the customer is watching. Glass Eye 2000 is fun and rewarding, and it has helped us to become better artists. Sharon, her husband Rick, and her son Brent are partners in the stained glass studio RainBowS Stained Glass. She and Rick are self-taught, and when Brent returned from the Air Force to civilian life they taught the craft to him. Sharon says that working with stained glass has allowed her to discover her creative side, and that now the world seems suddenly larger and more beautiful. 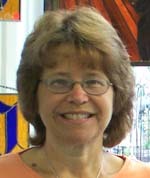 She works with glass every day either in design or construction, or in helping students learn the art.